The facilitators have become very confident in their delivery of the programme as they progress through the sessions and are enjoying the experience. 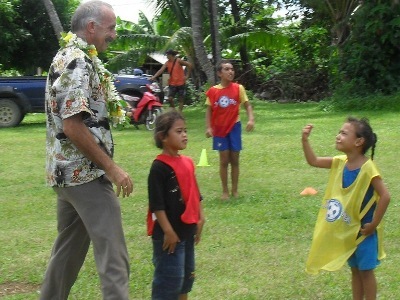 Vaitau Primary School had a special visit last Friday from the NZ High Commissioner John Carter and staff during their scheduled Just Play activities and he quickly grasped the concept of the programme and “Just Played” the activities together with the children. Active participation is the philosophy which students at Araura Primary School have engaged in over the past weeks and that’s how they like it! “The students are really thriving on the opportunity to practice soccer three times a week and the skill level and development of the children is noticeably increasing,” says Araura Primary School Principal, Gene Bartlett. “The school would like to thank Michelle for delivering this wonderful programme for the students of Araura Primary School,” says Bartlett. The Girls Brigade communities of Tautu and Arutanga have also taken to the programme and are using it to encourage their girls to become more active by delivering the activities during their regular weekly programmes.